What Hippocrates was getting at, is that the decline of our health starts in the colon. 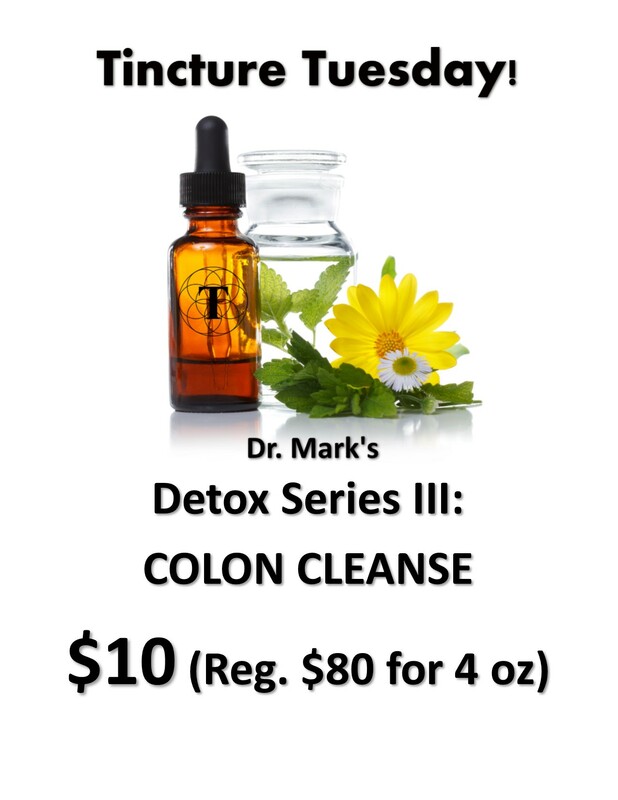 The colon is the largest part of your digestive system and plays an important role in overall digestive health. A healthy colon can prevent painful conditions like Irritable Bowel Syndrome, diverticulosis, colon cancer, and more. In fact, colorectal cancer is one of the leading causes of cancer-related deaths in the United States. The colon (also known as the large intestine), is the last stop in food’s journey through the digestive tract, and produces solid waste for elimination. When waste isn’t eliminated properly, the food putrefies and those toxins get recirculated. Unfortunately, the majority of my patients experience constipation, and until their elimination becomes regular their bodies are reabsorbing the waste products. This formula supports healthy digestion, proper elimination and regularity. The herbs in this tincture are antimicrobial, anti-inflammatory, and healing to the mucous membranes. – Dr. Mark Carney, RND, LAc. What’s Inside: Gentian lutea (Gentian Root) – Native to the mountains of central and southern Europe, Gentian has been used for over three thousand years to treat digestive disorders. Gentian’s bitterness stimulates production of gastric juices and bile and helps to relieve dyspepsia, morning sickness, flatulence, and indigestion. Gentian has the ability to clean the bowel and cleanse morbid matter from the colon. Achillea millefolium (Yarrow) – Yarrow is a flowering plant found in the Northern Hemisphere and is called “plumajillo” or “little feather” in Spanish. Yarrow has astringent, antiseptic, and anti-inflammatory properties. Combined with it’s antispasmodic activity, this makes Yarrow useful in treating gastritis, Irritable Bowel Syndrome, colitis, and diarrhea. Pelargonium maculata (Cranesbill) – Cranesbill (A.K.A. The Geranium flower) can be found all over the world’s temperate regions, but it’s extensive health benefits are not widely known. Germanium reduces inflammation and irritation and contains antibacterial, antifungal, and antioxidant properties. It also assists with digestion function and helps inhibit excess gas in the intestines. Mentha piperita (Peppermint)– Peppermint has been used for digestive relief since ancient times, and the “mint-after-a-meal” custom dates back to ancient Rome. The main active ingredients in Peppermint, menthol and methyl salicylate have anti-spasmodic actions that soothe the muscles of the stomach and intestinal tract. They also have powerful pain-killing properties. Elettaria cardamomum (Cardamom)– A relative of Ginger and Turmeric, Cardamom has anti-cancer activity by increasing activity of natural killer cells. Specifically, Cardamom inhibits colon cancer by preventing cellular damage due to accumulated toxins and waste products, a process that promotes inflammation and can increase risk of cancer. Foeniculum vulgare (Fennel) – Fennel is a flowering plant in the carrot family that acts as an antispasmodic agent in the colon, relieving gas, bloating, and cramping. Fennel enhances regularity and has also been found to remove carcinogens from the digestive tract, helping to prevent colon cancer. Matricaria chamomilla (Chamomile) – Chamomile works on secondary nerves and muscles, indirectly relaxing the whole body by easing tension and stress—including in the digestive system. Chamomile soothes the walls of the intestines and relaxes the nervous system which is especially effective when the underlying cause of digestive distress is anxiety or stress. Chamomile also increases the production of bile, aiding the digestive process. Zingiber officinale (Ginger) – Ginger has a long tradition of effectiveness in alleviating symptoms of gastrointestinal distress. Ginger promotes the elimination of intestinal gas and relaxes and soothes the intestinal tract. Ginger contains the potent anti-inflammatory gingerols. Recent studies strongly suggest that ginger compounds like gingerols may be effective at preventing colorectal cancer. Hydrastis canadensis (Goldenseal) – Goldenseal has long been used medicinally by Native American tribes of the northeast and in 1910, it was nearly harvested to extinction. Goldenseal has antimicrobial activity and supports healthy digestion by maintaining healthy mucous membranes. What You Can Expect: This tincture can improve digestion and regularity. You may experience less bloating, less gas, less heart burn, and less “rumbling” in your stomach. Dosage: The effect of tinctures vary, because each of us are unique. The average recommendation is 30 drops 3xday. Shake well before dispensing each dose. The liquid can be taken straight, or mixed into water or another beverage. For fastest absorption, hold the liquid under your tongue for ten seconds, then swallow.